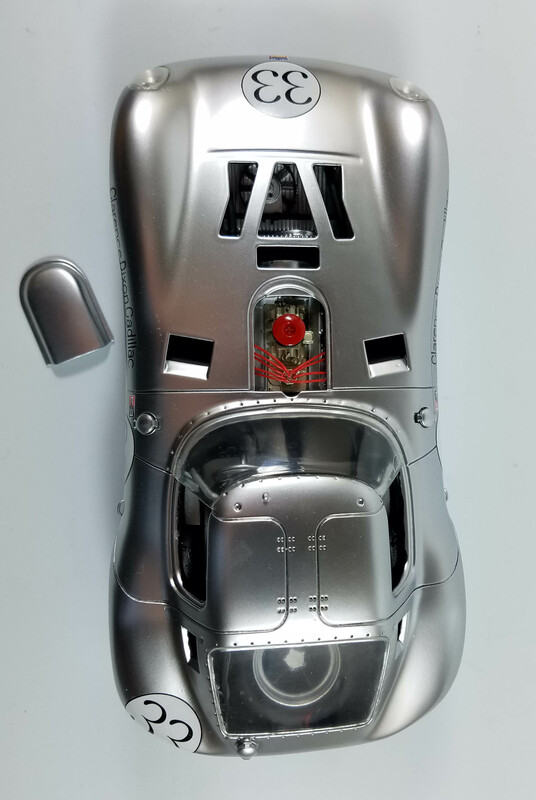 This sealed body cast-resin model highlights the Cheetah’s truncated rear end and long muscular hood with air filter cover and giant wheels under its bulging fenders. 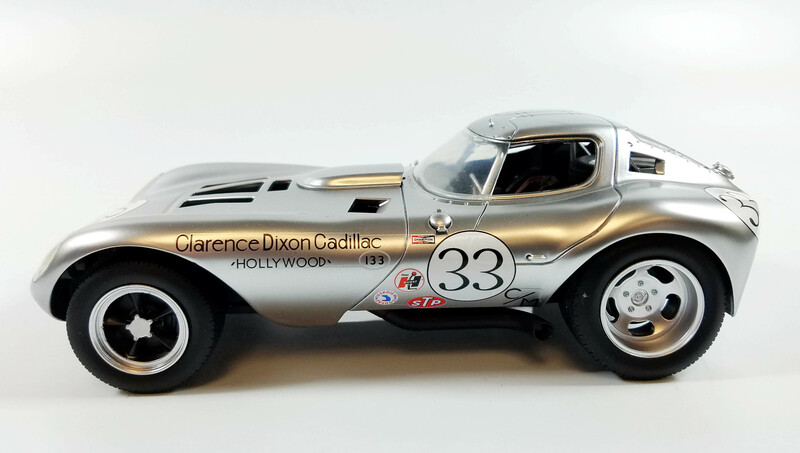 This one is the 1964 Cheetah in Team Clarence Dixon Cadillac exactly as it was when Mike Jones drove the car in the L.A. Times Grand Prix at Riverside. Only 10 Cheetahs were made, all but the first two with Fiberglas bodies. Originally designer and Chevrolet specialty car builder and tuner Bill Thomas dreamed up the Cheetah along with fabricator, designer and Indy 500 driver Don Edmunds with some backing from Chevrolet. They were hoping to challenge the successful Shelby Cobra at the time. Legend has it that Edmunds laid all the parts, many from Chevy, on the shop floor and drew up the chassis right there with chalk on the floor. Originally this was to be a sporty cruiser, but soon became a racer. The first two were made of aluminum until several accidents, then Fiberglas bodies were created. The chassis was chromoly tubing with the engine placed way back in the chassis to better balance the racer, like a mid-engine (rear-engined) race car. One issue was too much heat under the massive hood, causing engine failures. Drivers also complained of the heat in the cockpit as exhaust heads went over the tops of drivers’ legs. Ouch! The cars were raced a lot in the early- to mid-1960s and one appeared in an Elvis Presley movie, Spinout. The modeled No. 33 with Dixon Cadillac livery was, according to Barrett-Jackson Auctions, originally ordered by Jack Goodman who owned the Caddy dealership. It reportedly is the only Cheetah to sport, and race, Corvette’s 427 cid L88 aluminum head racing engine. 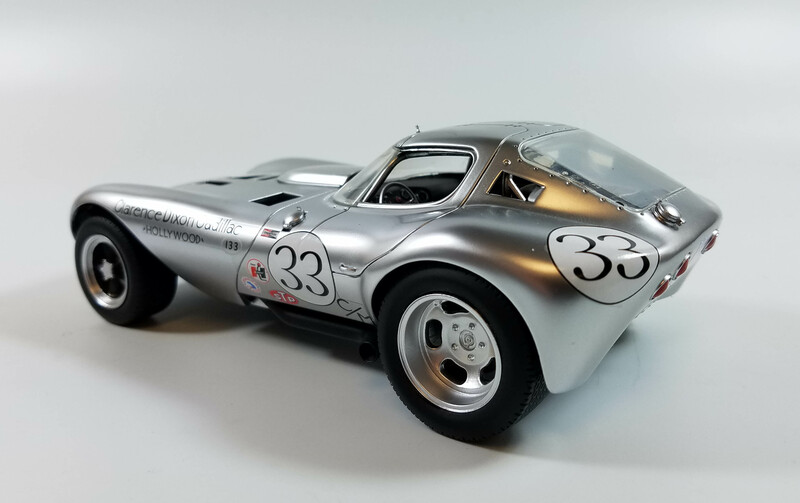 It was eventually sold to James Phillips who won the 1968 A/SR championship for the Southern Pacific region of the SCCA. 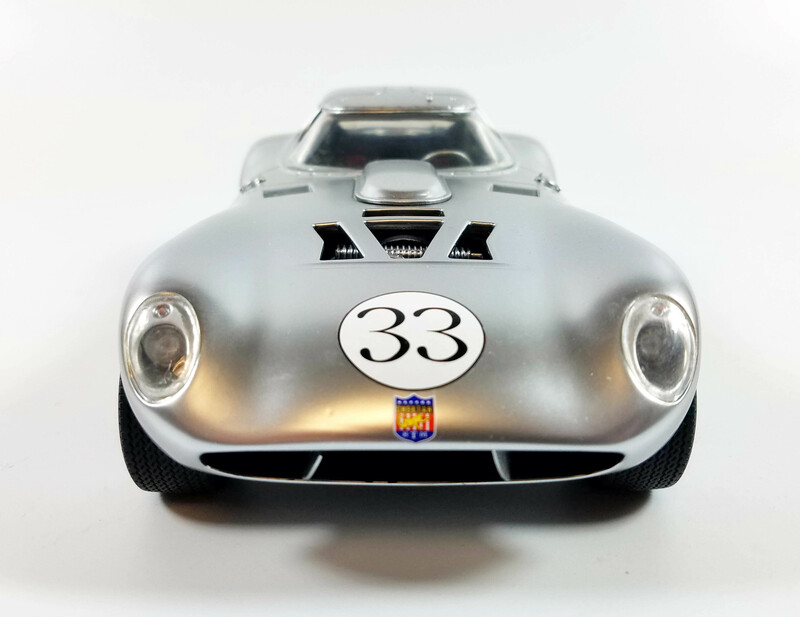 The car raced for five years and was originally ordered in Corvette Sebring Silver with a black interior, which it still has. 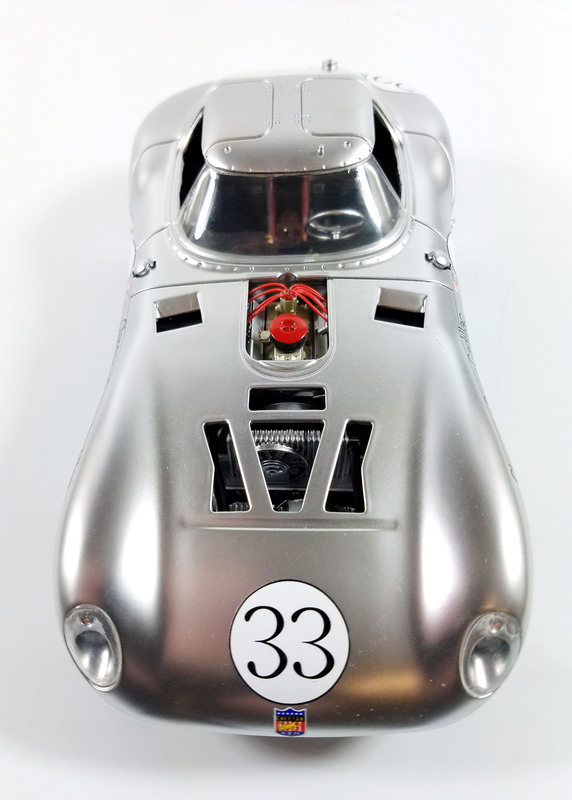 What we reviewed was a near production model that is stunning in appearance with all the correct labeling of the 1964 race model with a beautifully detailed body. I love this matte metallic finish, really spectacular! There are rivet indentations for the overhead door hinges and around the large rear window. Petit door handles are at the bottom of what were basically gullwing doors. Two gas caps sprout in front of the cockpit on either side of the car and there is another below the rear window. Huge holes are carved in the hood to cool its Vette engine, while inside that hood you see two huge radiators and fans to further aid in cool a powerplant that frequently overheated. A reversed hood scoop sits middle of the hood and we’re told the air cleaner under that will be 3mm larger on the production model and the hood vent will be magnetic, to keep it firmly in place. Under the air cleaner of course is the Corvette engine block and red wiring harness. Tires are all treaded with huge rear tires that fill the wheel wells and the wheels are different front and rear. Fronts are 5-spoke with blackened spokes while the rears are plain silver with five molded-in bolts to hold them on. Headlights are housed inside large protective lenses common in the day and there are four circular red taillights in back. Front and rear there also is a handsome red, white and blue Cheetah logo with a yellow cheetah as the mascot. The cockpit features black and red seats with nicely detailed shoulder and lap belts. The dash is well detailed with all the appropriate gauges with detailed faces. A racy silver 3-spoke steering wheel also is in there and a gear shift lever on the transmission tunnel and inside the back window, a huge spare front tire. 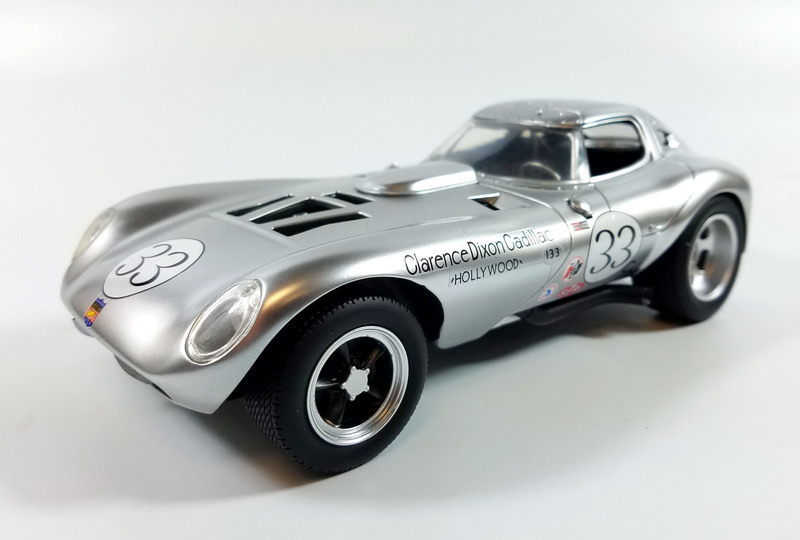 The Cheetah, while not always a winner on track, is a winner in die-cast resin. Can’t wait to see the final production version. Replicarz has said it’s coming this year, and since they let me look at a pre-production model I believe the model will be released soon. I’d estimate by May! Thanks for the quick response on the release date. I forgot to ask one other thing. 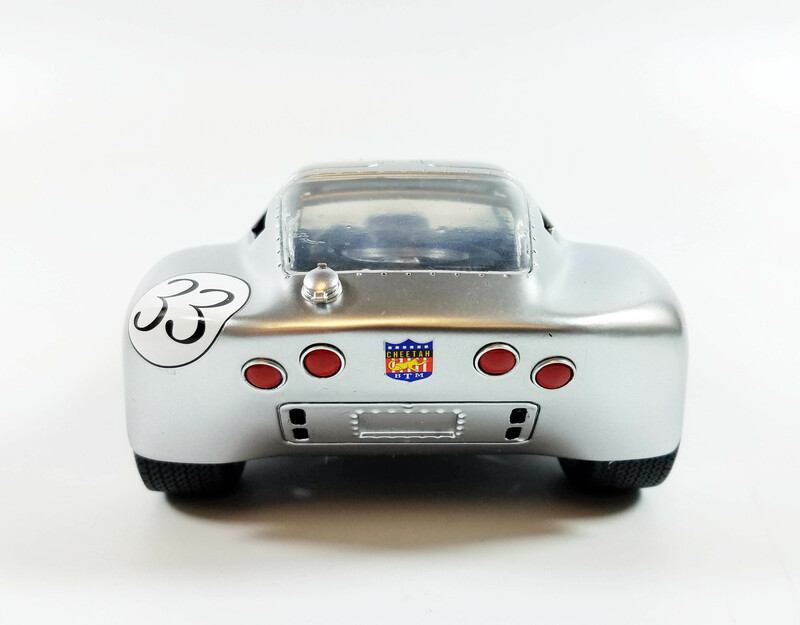 Some sites offer free shipping on pre-orders of yet to be released cars. Do you know if this will be true here? The big rear wheels were added after Jack Goodman(owner of Clarence Dixon Cadillac) sold it to Jim Phillips. Mike Jones only drove the Dixon Cheetah once, at the October, 1964 Los Angeles Times GP at Riverside International Raceway. The 396 and rock crusher transmission were installed in August, 1965. The large rear fenders were added at that time. Rolf Picard was the driver at the 1965 LA Times GP. It only raced twice with the big block, while Jack Goodman owned it. The first time was a shake down weekend in August at San Louis Obispo, CA. NICE! will the hood and doors open?? No Ray, this is sealed body, so doors and hood do not open. But that scoop over the engine and air filter will come off so you can see below it. I think the pix show you that.